Bees and wasps are a common pest found in any yard. They can ruin any casual time that is spent relaxing outside in your yard. Bees and wasps also like to build their nests in your kids swing sets, family picnic tables and porches. Keeping bees and wasps out of your yard is a necessity if you want to keep your calm and casual time outside in your yard. Keeping bees nests out of your yard will have you getting rid of the bees first in order to get to their nest. The best time to find a bees nest is when dusk is just beginning or late dawn when the sun starts to rise. Early dusk or late dawn is the best time to notice the shimmer of bee wings moving toward their nest. Sometimes you can be lucky enough to see a whole swarm of bees surrounding the nest trying to make their way inside or back out of the nest. Unfortunately the only way to really get rid of bees is to kill bees. The best bet is to use a commercial spray and spray it right into the nest. Spraying the nests should be done in the evening or the dark whichever is easier for you. To avoid the risk of being stung you might want to dress in long sleeves, pants and gloves. Spray the nest thoroughly and to make sure spray the nest once more the next night. Watch the nest during dusk or dawn for any bee traffic to or from the nest. Keep spraying until you don't see any bees anymore once the bee traffic is gone you can start to remove the nest. Now that the current hive of bees is dead you want to get rid of the nest so that it can't be reclaimed later by another batch of bees later in the season. Dress in your body covering clothes again just to make sure you don't get stung by any hiding bees. Knock the nest down if it is high up and take it out of a hole if that's where it is. If the bee nest is in the ground you will want to fill the hole where you found the nest. If the nest is inside your siding or brick walls you may still need to call a professional to have it removed. 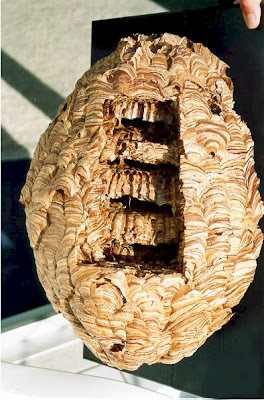 Keeping wasps nest out of your yard is much the same as keeping bees nests out of your yard. However you will want to spray and try to kill all the wasps the first time. You should also spray the wasp nest in the evening when you will be less likely to be bit by the wasps. Find the wasp nest by looking for heavy wasp traffic concentrated in one area. This can be done at dawn or dusk much like you did for the bees nests. Wait for the sun to go down for the evening and dress yourself again in body covering clothes. Go outside and spray the entrance to the wasp nest with a commercial spray. Spray very liberally and leave slowly when finished. Projectile spray is great for wasp nests on higher ground while you want to look for non-projectile sprays for nests underground. Don't knock down the wasp nest or fill the hole until you are sure that it is totally vacated and no wasps continue to call it home. Wasps and bees will continue to build nests in the same areas during every migration. Whenever you notice more wasps or bees in your area you will want to check the old sites. If the wasps or bees have moved on you will then want to start looking for their new nests again. Keeping bees and wasps nests out of your yard needs to be done anytime you see an influx of bees or wasps.